Penny is a former Music and Visual Arts teacher who was lured away by the bright lights and easy money of self employment. She has degrees in Music, Visual Arts and Education and is also a member of the Canadian Society of Composers. 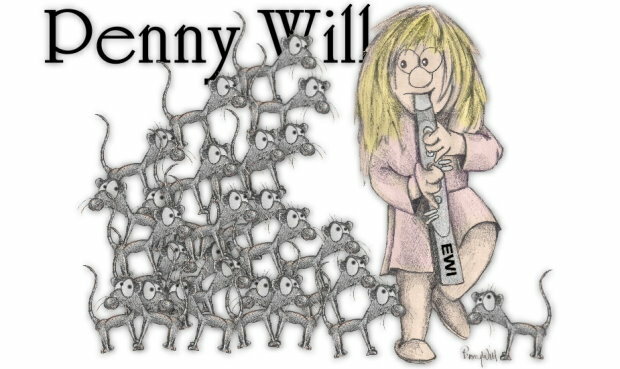 Penny has developed flutegirl.ca, a website with play-along music for flute, EWI, violin, oboe, and recorder. When not hunched over the drawing board, Penny can usually be found knitting unwanted items for relatives and listening to her son's music. Music's Greatest Lesson? The Value of "Every Day Effort"
Many of my videos are terrible. Many are experiments. Many are too short. Many are too long. I've deleted countless failures and I've re-issued some with improvements. Not everything has to be gold. This is the incredibly valuable lesson of music. A little effort every day and you can move mountains. When Is Too Late to Learn An Instrument? There is a misconception in the world that learning is for the young. That somehow if you don't become a concert pianist by the age of six, you may as well give up music altogether. For one thing,f I don't want a six-year-old deciding my career path, but also it's not all or nothing with music. Transposition is a musical term for moving notes higher or lower to change key. So why do arrangers transpose? Why not keep everything in it's original key and for that matter why don't composers always write in C, as it has no flats or sharps? Choosing the key of a piece is somewhat like choosing a seat in an airplane. Though all the seats are sort of the same, everyone has preferences, for various reasons. Piano rolls were paper tubes that made a player piano play a song. You would thread in one end of the paper roll -- kind of like an old film projector. As the paper fed through, little holes would tell the piano what notes to play. Fast forward a few centuries and meet digital music's digital equivalent: MIDI files. Eavesdropping on a conversation and only catching the odd word is one of life's great frustrations. Asking people to speak up or moving your chair to join their table is not likely to be met with much enthusiasm. So what's to be done? Amplify! Why do some people find playing a song very easy and others find it exceedingly difficult? I think it's because as we practice we are basically trying to crack the code of a piece. Some will understand it immediately, for some it takes a moment, and some never seem to get it. The best part of all, is once you have cracked one type, the next song in that style or genre is that much easier as you have the code partially cracked already. For that reason it's important to try many different styles of music. Much like with video games, my philosophy of learning to play a musical instrument is the rewards make you want to move on. I've developed this view of playing an instrument, in no small part, by watching my son. Just as with a video game, he had to move on in levels. He is now an amazing guitarist and musician.